In the Standard Model (SM) of particle physics there is no interaction that changes the net flavour of a lepton. However this conservation of flavour unlike other quantities that are conserved in the SM e.g. charge, has no known associated symmetry and so is believed to not be an absolute symmetry. Indeed flavour changing processes of neutral leptons, neutrinos, have been observed through neutrino oscillations and so flavour changing processes of charged leptons are also expected and neutrino oscillations can produce a very small amount of flavour violation in the charged lepton sector. However the amount is determined by (MW/mν)4 and due to the smallness of the neutrino mass is tiny i.e. O(10-50) and unmeasurable. If however there is physics beyond the SM (BSM) at mass scales higher than the neutrino e.g. from new types of interactions involving supersymmetric particles or extra dimensions then the rate of charged lepton flavour violating (CLFV) processes can be at a measurable rate i.e. a branching ratio of < 10-20. Given the unobservable rate of CLFV in the SM (with neutrino oscillations) then any observation of CLFV would be unambiguous evidence for BSM physics. The measurements of the next generation of CLFV experiments have a sensitivity to new physics from the mass scales being probed at the LHC (0.5 - 5 TeV) to mass scales far beyond the reach of the LHC, potentially up to 5,000 TeV. They offer a complementary way to search for new physics and to better understand the origin of flavour which has ramifications for explaining the matter anti-matter asymmetry in the universe. At UCL we are seeking to make the first measurement of CLFV through our involvement in the Mu2e experiment. This experiment will search for CLFV through the coherent neutrinoless conversion of a muon to an electron in the field of a nucleus i.e. eN → μN with a single event sensitivity as low as 10-17. 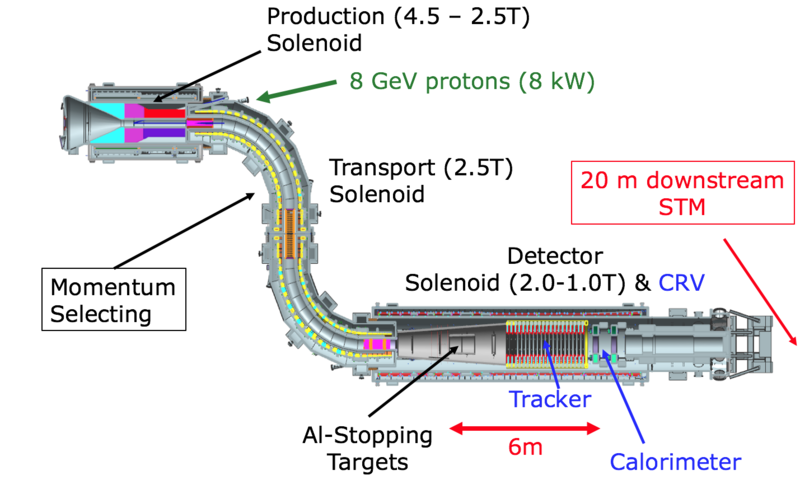 In this experiment 8 GeV protons from the Fermilab proton accelerator hit a graphite target and the muons from the decay of pions produced from the proton interaction are stopped in thin aluminium disks. Once stopped the muon can either: decay from the 1s atomic orbit (releasing two neutrinos and an electron), be captured (via the weak interaction) by the nucleus (releasing protons, photons and neutrinos) or, we hope, convert to an electron without any other products. In order to have a sensitivity down to 10-17 we need to stop 2x1018 muons and this requires a high power proton beam (8 kW) and a mechanism to preferentially select low energy muons that can be captured by the aluminium disks. Muons above a momentum of 60 MeV will simply go through the disks and not form muonic-Al atoms. To select the low energy muons the experiment has a novel 2.5-4.5T "pion capture" superconducting solenoid (show below). This reflects back a large number of low energy pions that are going in the direction of the incoming proton to produce low energy muons in the opposite direction to the incoming proton. A series of toroidal magnets then charge select the lowest momenta muons. The unique signature (by virtue of producing no neutrinos) of the CLFV process is a single electron produced with an energy (minus the atomic binding energy) of a muon at rest. With Mu2e's aluminium muonic atoms, the CLFV process should produce electrons of energy 104 MeV. The electrons however lose some energy before they are detected and the detectors have a finite resolution and so the electrons from the CLFV process typically have energies of 102 - 105 MeV. 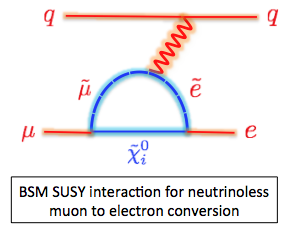 Electrons at the lower end of this energy range can be produced from muons undergoing a SM decay from the 1s atomic orbit by virtue of the energy imparted by the nuclear recoil or throughout this range by pions being captured by the nucleus, producing photons that asymmetrically convert to e+e- and so produce electrons with energies above 100 MeV. Understanding the rate and spectra of these backgrounds is critical to achieving the aims of the experiment.